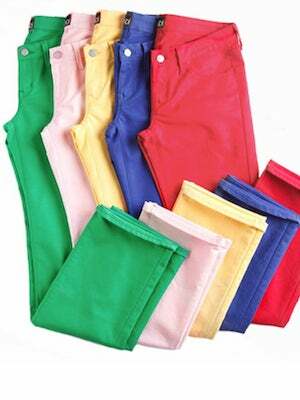 Eye Candy: INDi Denim Launches Colored Custom-Fit Jeans! Here at R29 S.F., we take jean scouting and sporting very seriously. Give us a pretty pair with a twist, and we're happy campers. So imagine our glee when we heard that Bay Area custom-denim brand INDi has just launched five new and brilliant colors: Admiral red, primrose yellow, Pacific blue, laurel green, and magnolia pink. In addition to the mouth-watering hues, these $175 wonders will fit any tuckus a glove. Choose your fave fit (skinny, slim, or classic) , enter your measurements into INDi's custom platform, and a few weeks later cut-just-for-you springtime denim will arrive at your front door. While you wait, peruse the brand's guide to wearing the bold-hued numbers, inspired by local bloggers and R29 faves Annabel Ly and Anh from 9-to-5 Chic! Which color do you covet most?